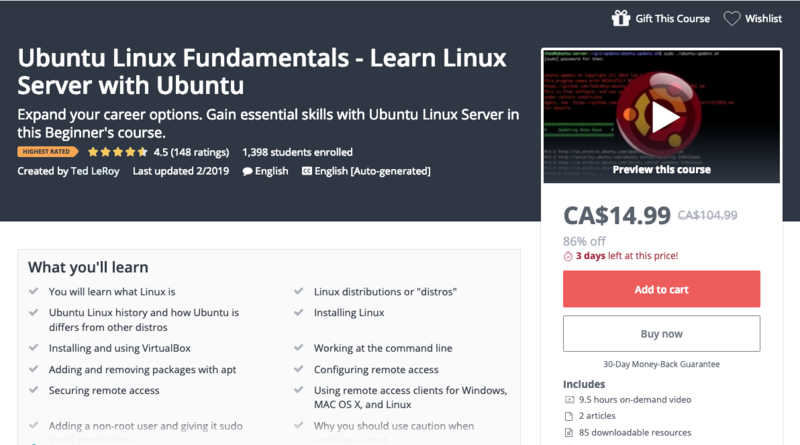 I've recently released a new course on Udemy called "Ubuntu Linux Fundamentals - Learn Linux Server with Ubuntu"
Here's a coupon for 90% off. It's normally $100, but you can get it for $10. This coupon is only good until midnight, Saturday, December 2nd, 2017, so grab it now! Ubuntu Linux is consistently among the top 5 Linux Desktop and Server distributions. Many top employers are searching for people who understand Linux. If you understand Linux, you understand the operating system that powers much of the Internet, and many, many "smart" devices such as phones, tablets, cars, and wireless routers. You do NOT have to have an extra computer to load Linux on to take this course. You have a 30 day, no questions asked, money back guarantee if you're not fully satisfied with the course. You have lifetime full access to the course and all updates and additions. Ubuntu's a great place to start learning Linux. It's a well maintained, full featured, well documented and supported, free operating system. Unleash the power of Ubuntu's command line tools. All that and more in this course will have you walking away from the course at the end with the knowledge you need to be comfortable with Linux at home or at work. You should have access to a Microsoft Windows, MAC OS X, or Linux computer. Some computer understanding, such as basic keyboard use, what a Hard Drive is, and what RAM (memory) is. You do NOT need an extra computer to load Ubuntu on to take this course. You do not have to be a technical person to take this course. What are you waiting for? Learn Linux now!